Pinterest has grown into a huge selling platform where both visuals and text are central factors. I have recently found myself using Pinterest more and more to explore travel options, hoping to stumble upon a great travel blog that might have been pushed so far down the Google search results that I would never have come across it. Pinterest gives us creatives, even if we are just beginners, a good chance to reach new audiences, if we do it right. That’s why, when it comes to your monetization strategy, Pinterest should definitely play a significant part in your efforts. You should make sure that you are familiar with your options and about what you can share and how. You don’t want to miss the opportunity to help others reach your content or to start making money so that you can achieve your goal of doing what you love with some financial ease. In a previous blog post we discussed the advantages of sharing experiences and not simply throwing around affiliate links. In this blog post, we focus on the options for monetization, whether or not you have a website, blog, or your own product to promote. 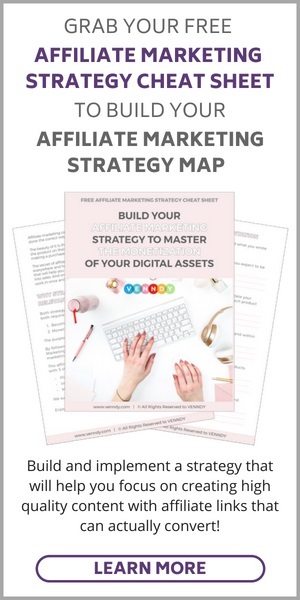 We take you step by step through the process until you hit those beautiful pins you have created for promoting your content, with or without, affiliate links. Some of the links below are affiliate links. This just means that if you choose to make a purchase, we may receive a small commission, at no extra cost to you. This will help support VENNDY’s expenses during this free beta stage. We are also using these links to showcase how you can use VENNDY’s tools for your own affiliate marketing reach. Pin your own product – say an e-book, a digital product, a service, a course, a photo gallery, or physical goods that you manufacture and sell on, for example, Etsy. By linking the pin to your landing page, you can increase awareness of the product. Pin for others – by offering virtual assistant services to manage Pinterest accounts for others . In addition to these two options, there is also the option of paid promotion and of activating buyable pins with direct shopping, which requires Pinterest’s approval. Using ads. You are paid for the ads displayed on your blog according to both the number of visitors who see them and the number of clicks on the ads. More visitors mean more potential clicks and higher earnings from your ad supplier. There are a few good ad serving platforms. In addition to Google AdSense which is very popular and well-known, you also have the option of higher commission rates and full-service ad management when using Mediavine (which has a minimum traffic requirement of at least 25K monthly page views) or Media.net (which is also good for beginners). Sponsored posts – by collaborating with brands, you can get paid for writing reviews or showcasing their products. Here too, the more traffic you have, the more you will, potentially, be paid. Lately, brands have increased their use of technology services that check on influencers and provide brands with stats and information not only about traffic but also about engagement and conversion. In other words, they are looking to try and evaluate how this collaboration could be translated into more traffic and actual sales for the brand. Building your own email list – by using an email sign-up form, you are giving your blog visitors something in return for their emails and subscription. Building your own email list is a very strong long-term asset which frees you from dependence on traffic from other sources. Its biggest advantage is that you are building a very targeted audience – once someone has signed up to your email list, they may be interested in any future products you will be offering or selling. It should be noted though that, given the latest changes in privacy policies (cookies and GDPR), in order to be 100% compliant in the EU, your opt-in freebie cannot be used as a bait and your free offering should not be dependent on receiving emails from subscribers. You must keep it very clear to subscribers that your freebie is not conditional on their agreement to sign up to your mailing list. Affiliate marketing – by linking your blog post content to products or services offered online, you get commission per sale if bought by one of your readers. If you are new to affiliate marketing or want to better understand how this works, you may want to check our Affiliate Marketing Guides as well as the Basics, the Ultimate Guide for Beginners, When Is It a Good Time To Start, How to Choose Programs, How To Choose Products and What Makes It Work. Make sure to follow the Federal Trade Commission (FTC) endorsement guidelines whenever you use affiliate links. You may want to check out our post on why and how to comply with FTC regulations. 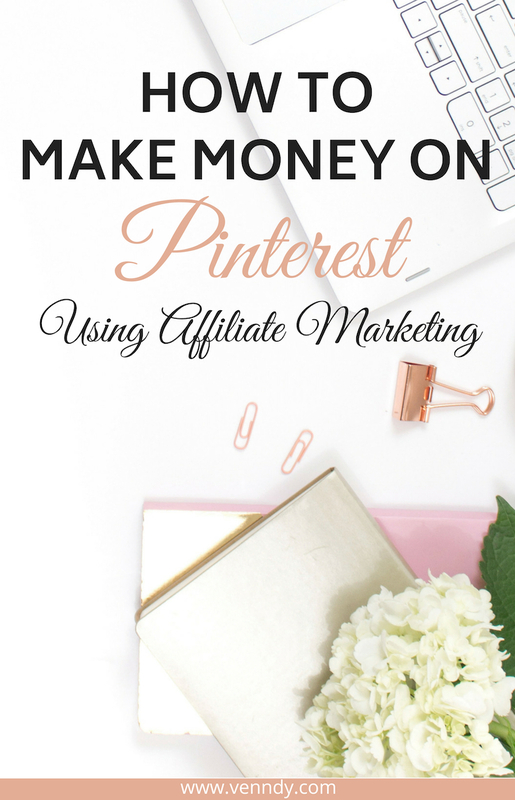 Another way you can try monetizing on Pinterest, even if you don’t have a blog or a website, is by adding your affiliate links directly to the URL box that you have for each pin. This way you can make money by being paid a commission for every sale you make through your pin. Below we share where you can find affiliate programs to promote on Pinterest. As Pinterest now allows the use of affiliate links, the process is fairly easy. You just get the link from your affiliate program and use it as the link for your pin where it says "Enter a website.” The link will contain all the information the e-commerce site needs to track a sales lead that came from you. If a lead turns into a sale, you get a commission for referring the customer to the site. However, as those of you have tried will know, there’s more to affiliate marketing than just throwing links anywhere and everywhere; you must still follow the basic techniques for building immediate virtual reliability. That doesn’t mean that there aren’t any successful product pins out there... 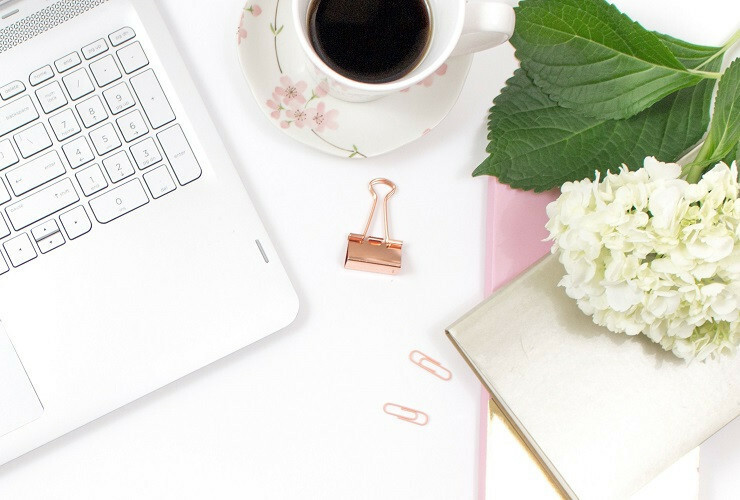 Some bloggers say they simply used an affiliate link to an online course they promoted and linked it to the course’s landing page and, boom, a sale was made! If you want to build some kind of steady and reliable stream of income, you’re better off not counting only on one-off sales but rather building a consistent methodology. Use images that are beautifully shot with good dimensions, in which you can really get a good feel for the product. Use a good description, somewhat personal, that outlines the benefits of the product. There might be a good overlay text and description that can do the work of explaining the product’s advantages and, at the same time, uses search-friendly wording. Have a clear Pinterest strategy for how and where you display the pins and how to help people find you. For example, if you’re focusing on stationery products and have your boards well arranged, you can help users find that beautiful product image you are using. Build credibility around your promoted products. The easiest way to do that is by only promoting products that you use and love and which are part of your "online personality.” Being yourself is a good strategy. No two people are the same, and by being authentic you will attract those who relate to your taste and your preferences. Be transparent about using the affiliate link and your relationship with the brands/merchant. Since you are directing users straight to the brands’ sites using the affiliate link, you must follow all relevant laws and regulations. Your FTC disclosure must be very clear and stand out in the description text box. Read the terms of both Pinterest and the affiliate program you are promoting. For example, it is not clear whether you can promote Amazon USA’s affiliate links directly on Pinterest. The same goes for Amazon’s European site. Although it seems they give a clearer answer for their EU affiliates in this post here, from a correspondence with their support team it seems using their affiliate links on Pinterest is not allowed. Below we share where you can find affiliate programs to promote on Pinterest. There are a few very good reasons why not to put affiliate links directly on Pinterest and, instead, to send users to other pages where your affiliate links are inserted (blog posts, other pages on your blog, a landing page, or some other service page). The good thing about Pinterest is that your pins are spread all over by other users (although this can also be a problem if you sent out a pin with a typo!). Once the pin is saved by another user, you lose control over where it goes and how far it reaches. This can be great when it comes to reaching new people, but it can also hurt your credibility if the URL or affiliate link is irrelevant. Products change, and merchants and brands change their affiliate programs. To learn more about Pinterest’s distribution of pins and its analytics, follow up on our upcoming post on the subject (coming soon). You keep control over the affiliate link you have inserted in case it ever changes, the program is no longer relevant, you choose to promote a different product of the same category, or you use a different program for promotion. You see, as soon as your pin is out there, you have very little control over it. The changes you make to your original pin will no longer be reflected in its subsequent uses by others. By directing users to a page where you collate all your promoted products around a certain experience or recommendation, you keep control over everything. You create pins free from affiliate links. Some people prefer not to click on affiliate links, and some boards don’t allow you to pin affiliate links on their board. You keep your Pinterest clean from affiliate links and FTC disclosures, as the affiliate link is not put directly into the pin. You play safe, whenever it is not clear whether a program allows using affiliate links on Pinterest. You will not be susceptible to Pinterest changing its mind or changing its policy on affiliate links. You can add a description, notes, reviews, and more information about you and your experience to help people make up their minds and better evaluate whether the product is a good fit. You retain the option to grow your brand awareness with people who click through to your own managed pages. This can help you keep your affiliate links fresh and relevant for future visits by your followers. For all these reasons, it is more practical and efficient not to put your affiliate links directly into your pin but rather to use your pin or, even better, multiple pin graphics for sending users to either your blog post, a landing page on your website if you have one, or to a designated URL you have with a service provider such as VENNDY. VENNDY is perfect for users who love to explore, shop, and share their tips, finds, and experiences and who are looking for a shop-like destination where all their recommended items can be found. To learn more about the 4 ways you can use VENNDY to share your content on Pinterest, check out this blog post. In-house/independent programs. There are quite a few independent programs that will accept users with a website who have just started out. We recommend you check them out (see the carousel below powered by VENNDY). Now that you have partnered with brands/merchants, built yourself a strategy, chosen the products you want to promote, and created a destination for your affiliate pins as discussed above (on your blog, VENNDY, or another platform), it’s time to start pinning and promoting. The strategy that worked best for me personally was creating beautiful pins that were eye-catching, easy to read, and relevant to my niche. As Pinterest is first and foremost visual, this is super important. It’s true that the description is also important, since Pinterest has upgraded its platform to be a sort of a search engine as well, but, even if they appear first on the page, your pins will not be clicked if there are other more attractive options. So, first off, use or make beautiful pins! There is a lot of advice out there on how to create great designs, and you can find e-books on designing and mixing colors and fonts. 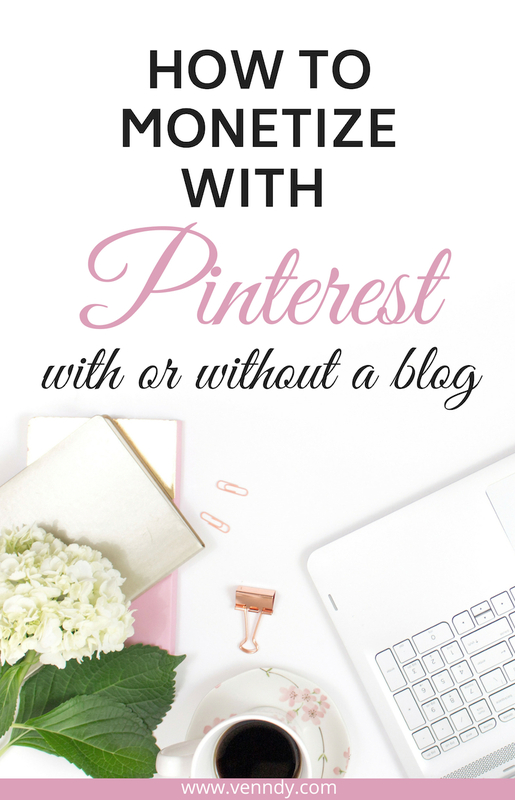 Here is one example with 6 Pinterest Pin Design Tips for Irresistible Pins. Create a gallery of pin designs that you like. Pin them to a secret board, which you can always turn to for visual inspiration. Learn how to master CANVA – it is really simple to use and free! Start creating your first pins and watch how you improve over time. Use free or paid photo stock for creating outstanding pin designs. Here is one example of a free option, where you can also pay to upgrade if needed. Create a few pinnable graphics with different colors, wording, and designs for your blog posts. Create some pins for every VENNDY story. Create some pins that will send users to your VENNDY Shop of Affiliate Products. Check out this carousel with our favorite tools for mastering these skills on Pinterest. If you find any of the tools helpful and want to save a link for a later use, you can sign up to VENNDY, love it, or add it to a wish list. 1. From your blog – Use either the Pinterest Save button on the image or the Pinterest browser button. Here is the Chrome version, just in case you haven’t installed it yet. The URL is generated automatically; you just need to edit the description and choose a board. 2. From VENNDY – Use the share button you see on every item and story page or the Pinterest browser button. Here too the URL is generated automatically, and you only need to edit the description and choose a board. To learn about 4 ways of using VENNDY’s tools on Pinterest, check out this blog post on how to use VENNDY to monetize on Pinterest along with some advice on why Pinterest is good for your affiliate marketing strategy. Click the Pinterest Save button. Here too, the website’s URL will be automatically generated. Add a description of the product with your review and choose a board. In order to insert your affiliate link, you need to go to the pin, click edit, then insert your affiliate link in the website field. Use the quick link generation bookmarklet from the relevant affiliate network to create a text link that includes your affiliate ID or tracking ID. Copy this link, with all the parameters, into the website field. As mentioned before, you want to keep your content fresh and relevant. Pinterest algorithms love fresh pins, so make sure you have multiple pins being circulated and uploaded over time. You can create a few pins in advance and upload them later with every blog post and VENNDY story. Additional pins can be uploaded from your computer or mobile device. 1. Click the plus sign (+) in the top-right corner of Pinterest, and then click Create Pin. 2. Click the camera icon to upload your pin from your computer. 3. Insert the URL to which you want users sent (where it says: "Add the URL this pin links to). This is where you will put your affiliate link , if you choose to use it directly on Pinterest. 4. Select a board for your pin and add a description. This is where you will put the FTC disclosure, if you have put a direct affiliate link in the pin’s URL. 1. On your profile, click the plus sign (+) in the top-right corner and choose Pin. 2. Select an image from your photo gallery and click NEXT. 3. Give a title, add a description, and insert the URL of your blog or VENNDY or your affiliate link. 4. Select a board where you want to save it. 5. You can always go back to your pin, click Edit (the pencil icon), and change the URL to update the affiliate link, but you need to that as soon as you upload the pin , before it has been repinned by others. Here is an example of a Story page on VENNDY with ideas about retro, teal-colored kitchen appliances: one collection of items, three different pin designs, and various different headings that will be shared at different times. Don’t forget to read our Pinterest best practices guide to make sure that you are not missing out on basics such as creating a business account, claiming and verifying your website, and enabling "rich pins.” For help in scheduling pins, staying consistent with your pinning, following up with timely pinning to different boards, and reaching new audiences, I find Tailwind services extremely helpful. 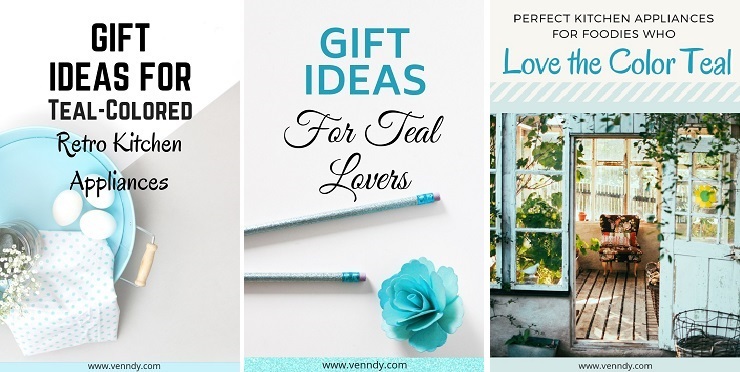 To learn more on how to use VENNDY to share your content, check out this blog post with some examples of how to share a single product and a collection of products. We really hope this was helpful and encourage you to now go and share your creativity. Make it useful, practical, or inspirational – whatever suits you best!